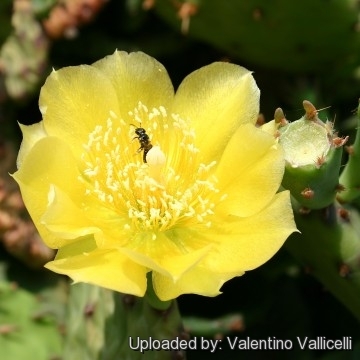 Accepted Scientific Name: Opuntia humifusa (Raf.) Raf. Gard. & Forest 2 1830 Remarks: Combination made by indirect reference to the basionym. Merrill, Ind. Rafinesquianus (1948) 171 states that the name is a nomen nudum. Also published by Schlechter, Linnaea 8 Lit. Ber. (1833) 31. Cactus humifusus (Opuntia humifusa) Photo by: Andrea B. Origin and Habitat: It is native of North-eastern Great Plains in North America, has good winter hardiness and grows as far north as southern Ontario (Canada). Naturalized elsewhere in north America, South and Central Europe; Argentina; China; Ethiopia; Haiti; Mauritius; South Africa; It is considered noxious in Australia and Tasmania. Habitat: It commonly occurs in rocky open glades, dry rocky or sandy grasslands, sandy and gravely washes of valleys along streams, fields, inland sand dunes, open woods and along railroad tracks. 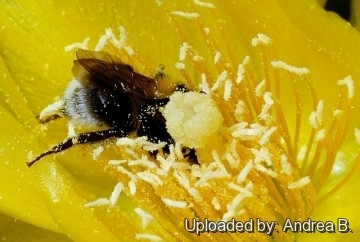 Ecology: Flowers are pollinated by insects and its seeds are dispersed by small mammals, in particular rabbits, and occasionally by the birds which consume its fruits. 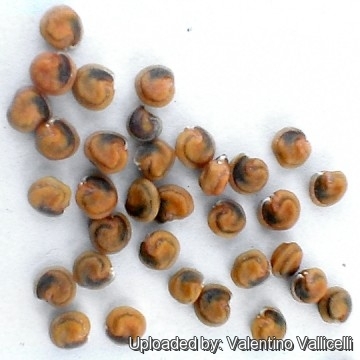 The seeds resist indeed a passage in the digestive system of these animals. It have a preference for the open areas and disappears when too high plants invade its habitat. 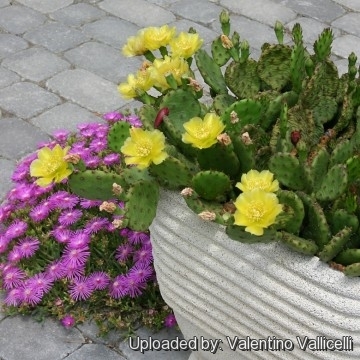 Opuntia rafinesquei var. minor Engelm. Description: It is a segmented herbaceous perennial whit flattened joints, forming a spiny prostrate, spreading or erect shrub. Often in the wild it spreads to forms small colonies up to 1 meter across ( or more as pads break off and root nearby). Stem: Cladodes round to obovate or elliptical, green (more or less purple tinged in winter) , flattened 5-15 cm long, 1 cm thick. The young cladodes are erect but in autumn become quite shrivelled and begin to lie down as the plants withdraw water in preparation for winter. Rarely overcome the eight of 30 cm. Areoles: With nasty tufts of yellow-brown glochids 3mm long. Subdivided regularly trough the whole surface and spaced out 1-2cm. Spines: Spineless or with a few scattered needle-like spines, usually single or sometimes paired. brown or grey to black 2-2,5cm long. Leaves: Conic, ephemeral 8 mm long. Roots: Usually fibrous and shallow. Flower: Diurnal, showy of a bright yellow colour, 5-7cm diameter, have 8-12 yellow rays and a bushy clump of yellow central stamens that react to the contact whit insect ( due to the sensitive filaments). Hermaphrodite (have both male and female organs) and autosterile. Fruit: Red-purple or reddish pyriform fleshy 1,5-4cm long and up to 2-3cm wide; edible, whit glochidiate areoles. Phenology: Blossoming time: June – July. Fruits ripen in late summer to autumn but can hang on the plant all year round. Notes: Though technically evergreen , the plants become quite deflated and scraggly in appearance during winter. However, the pads green up and plump up quickly in spring. 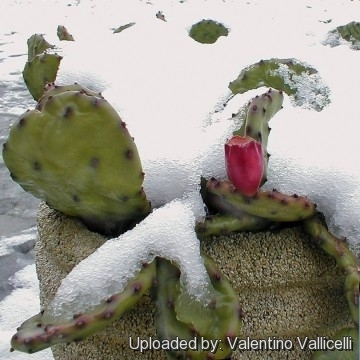 Notes: This is one of the more frost resistant cactus (Some population strive at 45° C under zero during the hard Canadian winter in south Ontario) easily recognizable for the rounded pads that wither and contract in winter. 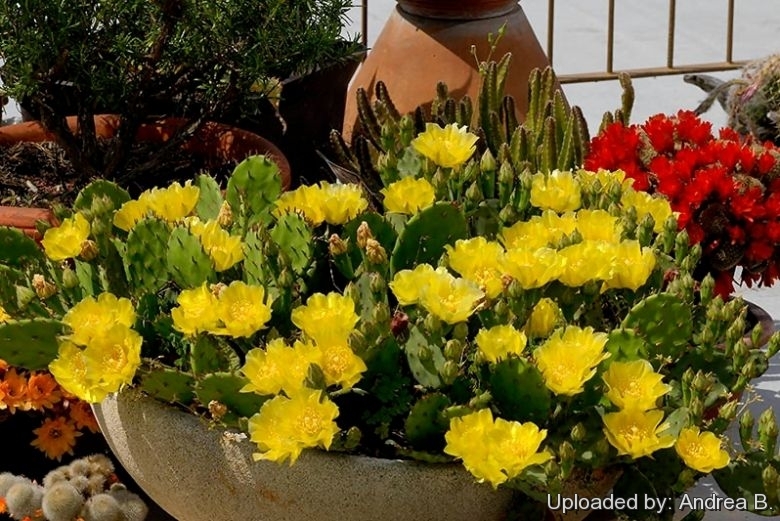 Remarks: Opuntia humifusa It is also commonly known with the name of Opuntia compressa, but this name is not correct at all, because Opuntia compressa is synonym of Opuntia ficus-indica. 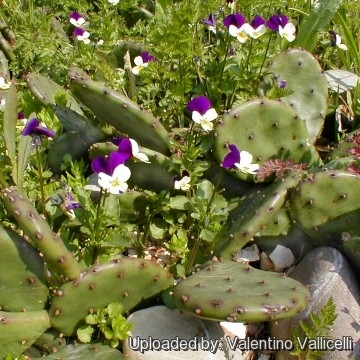 Cultivation and Propagation: It is a low maintenance plant that tolerate considerable neglect and will naturalize . Easy to cultivate outdoor in dry, sandy or gravely, well-drained soils. May be grown in clay soils as long as drainage is good and soils do not remain wet, it is very adaptable both in acid, neutral and basic (alkaline) soils, but prefers a pH in the range 6 to 7.5. No serious insect or disease problems. Can tolerates strong winds but not maritime exposure. Watering Needs: Must be kept fairly dry in winter but likes a reasonable supply of water in the growing season, tolerate dry condition but suffer if exposed to prolonged and severe drought. A position at the base of a south-facing wall or somewhere that can be protected from winter rain is best for this plant, but is however resistant to moisture and rain. Sun Exposure: Full sun (only), in semi shaded position wont produce many flowers. Propagation: Propagated by cuttings of leaf pads at any time in the growing season: previous year's pads may be severed at the joint during the growing season, dried for a week to ensure that the base is thoroughly dry and then planted directly in the garden (joint wound down) or in a potting medium. May also be grown from seed with moderate difficulty. Seed - sow early spring in a very well-drained compost in a greenhouse. When they are large enough to handle, prick the seedlings out into individual pots and grow them on in the greenhouse for at least their first two winters. Plant them out into their permanent positions in late spring or early summer, after the last expected frosts. Give the plants some protection from winter wet. Make sure you have some reserve plants in case those outdoors do not overwinter. Known hazards: O. humifusa pads are covered in numerous nasty barbed glochids (little prickles) not so much sharp and spiny as persistent and irritating. These glochids are easily dislodged when the plant is touched and then become stuck to the skin where they are difficult to see and remove, can cause considerable discomfort. Need a little care in handling. Seed: Seeds can be briefly roasted then ground into a powder. They are also used as a thickener. The Indian applies a poultice of the peeled pads to wounds, sores (Dakota and Pawnee) on the snake bites and on the rheumatism (Lakota) The juice of the fruits is used as a treatment for wart (Nanticoke), A pectoral tea made from the pads is used in the treatment of lung ailments. Garden: Rock gardens, raised beds, stone walls, sandy slopes, dry prairie, small area ground cover, pots. 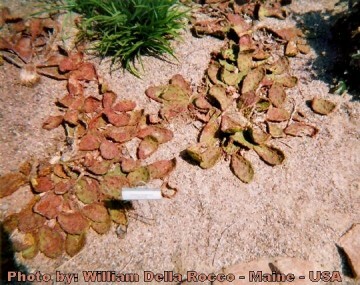 Graft: It is used as a winter hardy grafting stock for a range of cactus species. The Crow, Dakota and Pawnee use O. humifusa as an addictive to made their tinctures. It is also possible to use it (as for O. ficus-indica) to obtain a gum from its stem. It is used as a masticatory or can be mixed with oil to make candles. The juice of the boiled stem segments is very sticky. It is added to plaster, whitewash etc. to make it adhere better to walls. 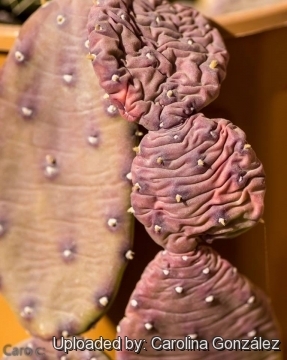 Propagation: The cactus reproduces by seed, by layering, and by resprouting from detached segments.